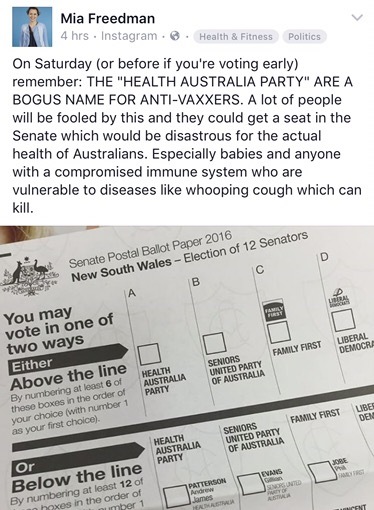 Health Australia Party is gaining momentum and the paid pro-vax mouthpieces are in damage control! (RealNewsAustralia) A popular website by Mia Freedman has been hitting out hard against the Health Australia Party on social media in the lead up to the election on July 2. As you can see she’s happy to make up whatever lies she wants in order to convince her thousands of followers and others who see this post that HAP are a bunch of Anti-Vaxxers. However, upon looking on the Health Australia Party website it doesn’t say anywhere at all that the Party takes an anti-vax stance. In fact, they clearly state all of their policies and only encourage transparency and open debate about the issue. It also appears her little smear campaign stunt has backfired. If you look at the comment section under it you’ll see many hundreds of comments. The usual abusive pro-vax people are there but take note of the anti-vax and/or reasonable comments calling out Mia’s post for what it is. Those comments themselves have hundreds of likes and more people are supporting them than Mia herself. When you see this sort of action being taken by the mainstream media or websites like mamamia who support the pro-vax big pharma agenda, it’s a clear indication that they’re scared. They know the masses are not only waking up but mobilizing. They fear the surge that likeminded, well researched Australians are undertaking. It’s great to see so many people waking up and seeing through the propaganda and calling it for what it is. freedman is a shill & mouthpiece for her buddies over at GSK but she is being exposed for this terrible, one sided & bias reporting. She certainly is. The comments in her thread say it all. That is a pretty serious accusation. Do you have proof of that? I actually read their policies and they do not state they are against immunization. I think we need to be careful with what we read. Last time I looked we are a democracy. If we are going to accuse people or parties then we need to back it up with facts. I think your comments will only incite hate speech and not ignite a healthy debate. I gather your comment is directed at Mia?